New Orleans restaurants have evolved strategies to get through summer. At Palace Cafe the “temperature lunch” special has its price pegged to the previous day’s high temperature. Advocate staff photo by MAX BECHERER. “A manager told me to ‘save all your tips and work as much as you can because once summer hits it won’t get busy again until after September,’ ” recalls Boyer, who was working at Lilette at the time and has since applied the lesson at other restaurant jobs. Inevitably, everyone in the New Orleans restaurant business learns what’s coming in summertime. It’s the slump, the doldrums — often simply characterized as the summertime blues. The local hospitality sector can run at a frenetic pace from fall to Carnival time and through the spring festival season. But business drops as the long New Orleans summer arrives and plunges even deeper as it stretches on. It’s hard on restaurant staff as tips run thin and hourly shifts are cut. For restaurants, the season can be fatal. An Advocate analysis found that more New Orleans restaurants close between June and September than any other time of the year. 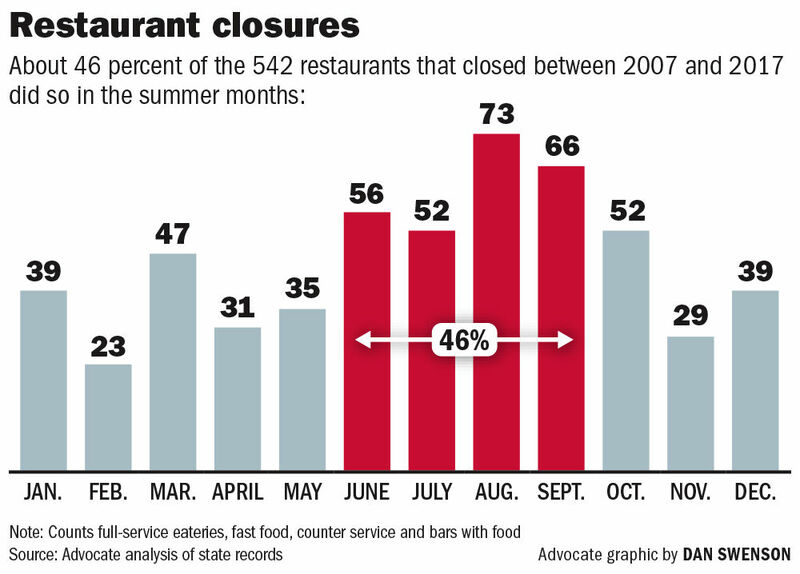 These four months accounted for 46 percent of all restaurant closures in the city between 2007 and 2017, based on the end dates of state food safety licenses. Summer has long been the predictable slow time in New Orleans. But other factors have been making their mark on the seasonal shifts by which restaurants live and die. One key consideration: the dramatic rise in the number of eateries competing for their share of the dining dollar in recent years. Anyone interested in New Orleans restaurants knows there are a lot of them. But how many? The current count is up from 984 total restaurants in August 2005, just before Hurricane Katrina, for a net gain of 232 restaurants in the city, or almost 24 percent. The largest increase was in full-service restaurants. There are 152 more of them in New Orleans today than before Katrina, a rise of more than 33 percent. New Orleans restaurants today operate in a city where the estimated population of 393,000 is still only about 81 percent the size it was before Katrina. The city had about 500 residents per restaurant in 2005, but in today’s increasingly competitive environment there are only about 325 residents per establishment. Visitor numbers have been growing in recent years, and New Orleans is now frequently touted in the travel media as a top destination. But in the summer, all bets are off and the pressure on restaurants grows. One read on the business cycle is the way annual revenue at New Orleans restaurants is distributed through the year. Vacant tables sit outside a restaurant on Magazine street in New Orleans. The city has witness a steady rise in the number of restaurants in recent years. Advocate Staff photo by SOPHIA GERMER. Womply, a Silicon Valley software provider for small and medium-sized businesses, provided The Advocate with an analysis of credit card transactions per month from full-service New Orleans restaurants. The peaks were in December and March, with each of those months contributing 10 percent to the total haul. Revenue bottomed out in June and August, which each account for just 7 percent. That’s a 30 percent difference in revenue from the best months to the worst. The abrupt end of the good times can be rattling, even for seasoned restaurant pros. Nick Lama was a chef at local kitchens for many years before opening his upscale Italian restaurant Avo in 2015. Steering his own restaurant through the past three summers has been eye-opening, he said. “You’re cruising along, and then reservations just fall off a cliff,” Lama said. The arrival of summer is usually heralded by a drumbeat of restaurant closings, including both new players and long-established names. This year, June began with the Mid-City bistro Rue 127 shuttering after eight years. Across the dining spectrum, Saucy’s BBQ was slated to close this weekend after six years on Magazine Street. When the once-pioneering Creole bistro Mat & Naddie’s closed in 2017 after 23 years, the news surprised many. But the timing in late May was no coincidence. “If you know you’re going to close, you close at the end of the season,” said Melissa Strong, who managed Mat & Naddie’s and is a partner in its related service Michael’s Catering. There’s often more than one consideration in play when a long-running restaurant shuts down, as Mat & Naddie’s showed. The catering arm was doing better than the restaurant, so chef and founder Steve Schwarz wanted to focus on that, Strong said. The departure of some key personnel also guided the decision. But then, there was also summer. The Uptown restaurant Mat & Naddie’s closed in 2017 after 23 years of serving upscale casual cuisine in New Orleans. Advocate staff photo by Ian McNulty. Chef Frank Brigtsen runs his acclaimed Brigtsen’s Restaurant in the Riverbend, near Mat & Naddie’s former home. He calls summer “the critical time” for New Orleans restaurants, and he takes nothing for granted as the season approaches. One summer bright spot, however, is Coolinary, a campaign of prix-fixe dining deals offered at local restaurants during August and coordinated by New Orleans & Co., the city’s recently renamed convention and visitors bureau. Last year, more than 100 restaurants participated in Coolinary, the most ever. Some restaurateurs, including Brigtsen, regard it as a vital lifeline. Chef Frank Brigtsen prepares his blackened tuna at Brigtsen’s Restaurant in New Orleans. Advocate staff photo by ELIOT KAMENITZ. But the summer is long, and the restaurant business can reach its nadir well after Labor Day. September, after all, is when tropical storm risks are historically highest, convention and event bookings are few, and many locals feel the pinch of back-to-school expenses. Dianne Sclafani, a consultant for the Louisiana Small Business Development Center, helps new restaurateurs get started. She urges them to consider seasonal impacts on their business plans from the start, comparing the effort to devising a hurricane preparedness plan. Changes across the city can throw some new curve balls. The impact of short-term rentals on neighborhood businesses is a frequent subject of debate, for instance. And Sclafani adds another particular summertime twist to the demographic puzzle: The post-Katrina influx to New Orleans of people who grew up elsewhere means summer vacation time can be a harder blow to restaurants. Her advice to small operators is to follow the example of the larger restaurant groups. While summer is tough all over, some in the business point to positive signs. “I think the city has done a great job of drawing more traffic when it’s needed and keeping downtown relevant longer into the summer,” said Levi Janssen, director of operations for Dickie Brennan & Co., which runs four large restaurants: Palace Café, Tableau, Dickie Brennan’s Steakhouse and Bourbon House. “In our view, the summers have gotten a lot better than they once were,” Janssen said. Adolfo Garcia, a partner in the restaurants La Boca, Ancora and High Hat Café, is also optimistic, especially comparing recent summers to the 1990s, when he was getting his start as a chef. Still, Garcia himself knows all too well what summer can do to a restaurant on the ropes. Last spring, when it was clear his Central City restaurant Primitivo was struggling, he pulled the plug in May, just shy of its second year in business. “When you know that downturn is coming, and you didn’t make enough money in February, March and April, you don’t have much hope to make it through summer,” he said. Advocate staff photo by SHERRI MILLER — Primitivo is part of a growing crop of restaurants on Oretha Castle Haley Boulevard in Central City. The summer slowdown is widespread, impacting both restaurants that rely on tourists and others with a more local clientele. Zea Rotisserie + Bar, for instance, has one location in New Orleans, near the Jefferson Parish line and others around the suburbs. They all take a hit in the summer, Reggio said. Even neighborhood joints with deep local roots are not immune. For instance, Wayne Baquet continues a long family tradition of Creole soul cooking at his Treme restaurant Li’l Dizzy’s. It has a loyal local following, especially at breakfast and weekend brunch. But the summer slowdown can still be hard to manage, especially when it comes to staff. Wayne Baquet, proprietor of L’il Dizzy’s Cafe in the Treme, serves gumbo, left, and trout Baquet. Advocate staff photo by ELIOT KAMENITZ. Sometimes, though, the summer slump can mean more work for restaurant staff. “Everyone wants to cut hours, so when there’s fewer people on a shift you’re picking up slack,” said Amber Landry, who has worked in service and kitchen positions around town for eight years. There is downtime as the summer days tick past, however, and this time can often be productive in different ways. Such creative flourishes aside, the summer lull is a slog for those trying to make a living. Instead of waiting on tables, they’re often just waiting for tables. At Dickie Brennan & Co. restaurants, Janssen jokes that his staff has reversed the grim motto “winter is coming” from the “Game of Thrones” TV series for local conditions. “Here, summer is coming,” he said. The preparations are serious business, however, and they start long before the temperature soars. “You manage the summer by starting these conversations months in advance, looking at what we’re going to do from a management level and a staff level,” said Janssen, who has logged 18 years in downtown New Orleans restaurants. Levi Janssen, operations director for Dickie Brennan & Co. restaurant group, at Palace Cafe on Canal Street. He said summer business has been improving but still requires careful planning across the company. Advocate staff photo by MAX BECHERER. The effort reaches into the kitchen too. Over the years, the company’s sprawling Creole brasserie Palace Café has evolved a lunch special with a varying price based on the previous day’s high temperature (a 91-degree high on Monday leads to a $9.10 lunch on Tuesday, and so forth). Janssen said the deal gets people in the door, and the low-cost, daily-changing special gives more kitchen staff a chance to experiment and fine-tune their skills. Restaurant repairs and renovations often are scheduled for summer, training ramps up, and managers engage in chess matches with their staffing schedules. Keeping a restaurant’s staff in place even when there’s not as much work is crucial, Janssen said. That’s because as bad as the summer can get, fall promises an upswing for those who make it through. Eventually, restaurants will call for all hands on deck again. Staff writer Jeff Adelson contributed to this article.